Beside that, it's impossible to have something nearer to that depiction in a very short period in the protostellar disk? or it would be much more little objects? Let consider extremely massive protoplanetary disk around sun-mass star: 0.1 Msun. Let consider it have uniform density and expanded to 20 AU. Dividing its mass by its square we obtain density of only 7000 kg/m2. And this 7000 kg would be spread by million kilometers in vertical direction. Even if the most dense regions would have 1000 times higher density, it anyway would be very far from that depiction. I would partially agree with planetary rings depicted like that, but even there such dense population of huge rocks would be unstable. They either quickly accreted in a moon or grind each other to dust. The fact is that Spain is having a terrible situation with the Scientific matter because the government is destroying all the possibilities por scientific research. Science in Russia is almost dead. They even disbanded the Academy of Sciences. Nothing more to say here. New Dark Ages are coming. Hi Warlord. Please read the forum rules. While we welcome suggestions, we ask that you use the search feature to check if they'd already been made. All of these ideas have been discussed before. Some are listed as planned features on the TODO list. 3 is already implemented (it is possible to find exotic life). You did not need to make this thread. Amazing! but even with those distances it only needs tens of millions of years to create large bodies because of trillions of collisions beetwen these small masses. I'm so sad to hear that. This is one of russians glory. We in Europe really need a new Athens or Alexandria becuase the austerity imposed by our governments by the dictation of the banks and the so called markets is destroying the Research culture of the southern countries. Hi, I had a very interesting idea for Space Engine. Why not add sound of winds in planets? It could be added by determining the air pressure and the speed of clouds. Or simply have an option to add the intensity of wind sound by a simple value, from a simple wind pattern to a very stormy sound. And why not also add lightning and sound of lightning. I don't think that would be so hard to implement. Well, Space Engine now has music according to the kind of planet, so maybe it wouldn't be so hard indeed. Another idea is to add sound to pulsars, sound of radio waves. At least there's a mod of Celestia to this. Other idea is to add an infrared mod. In this case, there would be an option to see the universe from a thermal perspective. In this case, hotter planets would shine more than colder planets. Everything would be in black and white, like some infrared cameras. Liquids would be dark, earth-like air would be black to very dark. Red stars emit more infrared than blue stars, so maybe they would be brighter. Fog and smoke would be transparent, so maybe Titan would have a transparent atmosphere in this mod. A mod for earthquakes and option of earthquake intensity. In this case, for volcanic, infernal worlds. Example: Io. For future ideas, i will post in this thread. Hi, I just think that you should add a "ring world" from the Halo trilogy. Maybe even the planet "Reach" from the same trilogy. It's all i'd like for this really nice space sim. yup. These suggestions are all related to orbital issues to make much more variety on every stellar system. Please I want to know what you think. SE dosen't account for submoons orbiting moons but I think this is sufficiently frequent in the galaxy to include them as a posibility (not to much change in coding probably). The submoons are unstable systems so they would be rare and should take into account a few parameters to exist. For example there would be extremely less frequent to find a submoon for a tidally locked moon than a non tidally locked moon (this instability also would apply for moons orbiting tidally locked planets). The Hill sphere of the moon that is orbited by a submoon should be quite large (proportional to finding a submoon there). In the Solar System there are no examples, but the possibility that Rhea (in Saturn) could have had a ring system is linked to this. On SE we find quite frequently moons with rings, so there is no reason to suppose that there can't be submoons nearly as frequent. In the Solar System we could have an extrema comparison with Neso (of Neptune) that is amazingly far away from the planet (so to have a quite big hill sphere in relation to his mass), and that orbits a planet that is quite far away from the sun (having itself a big Hill Sphere), so the presence of a submoon of Neso (if it was for example an object the size of Mercury) would be quite normal because all the components (Sun-Neptune-Neso) have extreme ratios and therefore Neso's immaginery submoon would be in a totally stable orbit (so to appear to us choosing a random part of the exosystems history). And finally to get this a little more strange we could talk about Subsubmoons, or higher order submoons (Moonception) taking into acount the ratios. I think it would be awesome to search for and there has to be an amazing amount of cases out there only in our galactic neighbourhood. This are two different things. I have seen both on SE (and is a feature I like a lot to be honest) but in the case of binary star's planets. Why not adding moons with orbits around a binary planet system (I have seen a lot of those by the way)? and Why not adding moons around each of the components of the binary planet system? and also What about binary systems of moons orbiting a main planet? And if that can be implemented (with the corresponding realistic gravitational zones of stability) Why not also adding ring systems enclosing byinary planets (huge rings I know and maybe a lot more difficoult to implement)? The occurrence of double asteroids and asteroid moons it's amazingly high in the Solar System. We don't know yet why they are so common but the fact is that they are (at least compared with what we normally espect). Many of these binaries are Near Earth Asteroids and we know about at least 48 Kuiper belt object binaries!! This has to be added as a posibility on Space Engine. It would be realisitc to show procedurally created systems of binary asteroids and binary cometary nucleus or simply asteroidal satellites. We think with our current models that the occurrence of binaries is higher near the stars: On the Solar System the fact is that the asteroids made like "rubble piles" can get spinning so fast (because of the YORP effect) at distances of the common NEOs so that the object creates two lobes that separete and evolve into binaries. So if added to the engine this should be taken into account. By the way It would be awesome to see the early stages of development of the separation of the two lobes of those objects. These two-lobes structured asteroids and cometary nucleus are also quite common. It upsets me that Space Engine can't ever reproduce a Kleoplatra, a Toutatis, an Itokawa, an Eros or a Churyumov-Yerasimenko two-lobe morphology when many objects in the universe are like that. And the last thing in this chapter: asteroid rings!!! Can we add rings to asteroids and maybe comets (far away comets I suppose because it would no survive as it developes a cometary tail)? I mean, I know it is not common, but it is sufficently as to encounter rings in our own Solar System taking into account we have resolved or observed by occultation only a small numer of them. 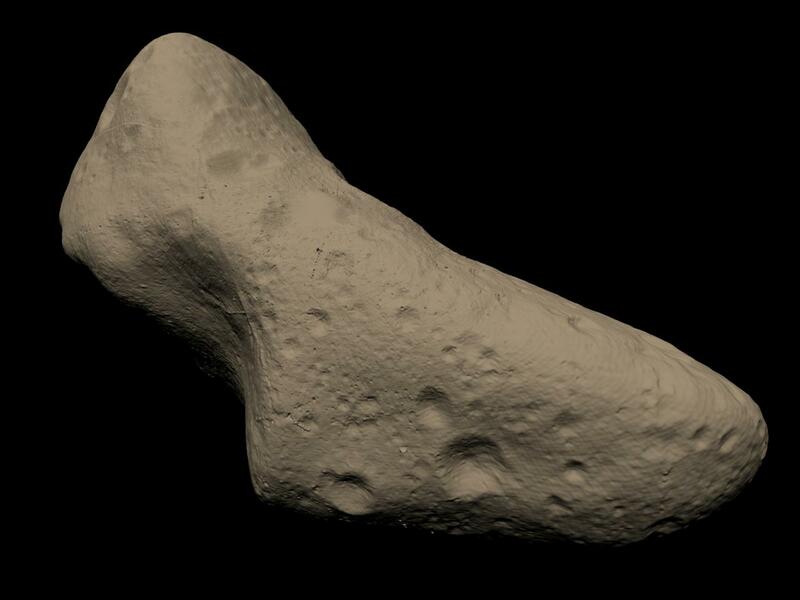 This would be an interesting feature because even if it is a 1/500 chance to find one asteroid like that it has to be added because we would explore far more than that. Space Engine is very rigid with the spectra of numbers of planets that a stellar system can have. It ranges from none to 12 more or less but it should allow to procedurally generate systems with anomalous number of planets. Why there are not systems with 50 planets for example (something that is not so strange as to never find one of those)? I think the programm needs more freedom in this to make more variety of planetary systems. Young planetary systems (that haven't overcome a planetary migration as our Solar System) may have even hundreds of planets!!! This is the oligarch theory of planet formation. It tells us that at the beggining of the solar system there where hundreds of planetary sized objects. So asking for 50 or even 70 planets shouldn't be so strange. What you think? I find all the planetary systems of SE looking quite the same, and obviusly it has to be like that because that is the common thing in our models. But the anomalies are not so unfrequent as far as the planetary models allow them. So what I "complaining" for is about the fact that all the systems have the planets orbiting in the same plane (more or less) with no exception and with circular orbits. The fact is that this occurs normaly and appears to be adjusted to our models but we have also spotted some high excentricity huge exoplanets. Even if this anomaly occurs for 1 system every 100 it is a priority to add them because searching for planets on the game would imply discovering many of these. I suppose that such eccentric orbits would make lower number of planets in the same system because of slingshots and big cataclysms. The other part of this suggestion has to do with the inclination of the orbits of some planets over the plane of the others. Why not to allow to the procedurally generation of planets in a 90 degrees orbit with respect to the plane of ecliptic for example? It will not be common, I know, but also we would find them in a few trips around stellar systems and so it has to be added as something that can happen. Those orbits can be explained because of captured rogue planets by a star. So the more denser the part of the galaxy is, the more highly inclined orbits for planets it has. Maybe in stellar clusters the stars are constantly capturing rogue planets expelled from the near stars so there would be a quite common thing. We have found in Upsilon Andromedae two exoplanets with 30 degrees of inclination between their orbits!! And some discoveries have tell us that maybe is even a very usual phenomenon like what was shown with HAT-P-11 so ther's no reason to avoid this for the next version in my opinion. My question here is if the Kuiper Belt would be well characterized in the near future or not. Vladimir has said some times that the objects in a system can't exceed a certain number for the program to load, but he also said recently that SE is going to be capable of loading huge amounts of objects. So what I want to say is that in that conversation with the New Horizons team poped up the Kuiper Belt model they use for their calculations (that has some hundreds KBO's orbits). The model is this. ¿Could it be included on SE's Solar System and be taken into account to procedurally generate similar structures on other solar-like systems? Didn't read all, I'm too tired now, but you must know that KBOs are already in SE. Most of them are disabled in the config due to long loading time, but you can enable them back. Go to universe.cfg and uncomment the desired lines in the PlanetsCatalogs list (there is also an asteroid catalog). SE can't handle 1+ million of objects in Solar system, so catalogs are limited to few thousand most bigger objects. Loading time is quite large, but it is already fixed for the 0.972. Would it be possible to implement Asteroid/comet belts using a scaled up ring system style thing that goes around a star instead of a planet? that way creating the illusion of one while taking up only 1 spot in the memory instead of 1,000,000s of tiny ones. Basically you're suggesting replacing individual objects with a ring texture. It could look good from far away, but probably awful when you view from within the system. You'd need a higher res texture which invokes the same problem it tries to solve. Basically you're suggesting replacing individual objects with a ring texture. It could look good from far away, but probably awful when you view from within the system. Maybe it could be a ring texture up until a certain distance, then it replaces it with actual particles? I'm no programmer so I have no idea how this might work. I don't think the blending between a ring texture and 3D models can be a problem. SpaceEngineer himself already talked about the problem about this : this require the simultaneous generation of billions of objects (as when you see a part of the disc, objects are moving and you have to generate all objects that are potentially here). This is the same problem with generating moving stars in a galaxy. Wait for a quantic supercomputer. Good point. Ah well, scrap that idea. This didn't solve anything. You still need to store and compute the movement of all these particles.